This discussion took place at Bundanon after Jonathan Duckworth’s ‘Situated Body’ workshop, where we all went out into the surrounding country to create some response to our geograhic situation, building from sensitivities cultivated in Catherine’s Feldenkrais-inspired ‘Distinct Body’ experiential anatomy workshops. Jonathan Duckworth: Does anyone want to talk about what they heard and what they experienced? George Poonkhin Khut: I built on the experience I had last time. And the key for me when I first came here and was in that dried up lake there, was this idea of listening to sounds around me and feeling that air, in terms of the acoustic property of the air here, and where I was in that place. And then listening to sounds and the sounds were very animated, obviously. The air is a medium through which sound travels, and also hearing the air in the trees, the changes in the pressure, and the wind directions. And then hearing those different sounds in different trees. Attending to all those different dynamics, and layers of information, and reflecting on some of those causes as well. But then connecting that eventually also into how I could bring that same quality of attention to what’s happening inside my body. And then thinking about a rhythm of going inside or going outside, or whether you potentially hold them together at the same time. And then I went down to the river, I started structuring that a little bit more to be something like a guided listening or an awareness opportunity. So that’s just the start of something that’s a bit of a workshop or something like that. And just a few different simple things like placing some water on your face and neck and ears, and then just feeling how the wind, the breeze, no matter how gentle it is, has a sort of directionality. And you can feel that kind of move around you in different ways, directly as a breeze and also as a temperature thing. Now thinking back to that idea about air pressure and the breeze, and then trying in your mind to zoom out a bit to think about how that changes from moment to moment, and then from hour to hour, and day and week and season. And just that sense that there’s a change here but it could also be quite different at different times. There was a lot of attention to the irregularity and unpredictability of it. It wasn’t kind of there’s air there and there, but an unevenness, and enjoying just riding that contour. That was one of the key things when I brought my attention back into something like my breath, or muscle tone, in my posture and breathing, just that appreciation of irregularity – not just of one particular sensation that got my attention, and how I could focus on one thing and then go out there and to another place. Then I wrote a little bit about how I might focus attention in on parts of things like breathing or muscle tone. It’s like being in a landscape and looking at things, you’re aware of all these other things going on, but you have a particular focus on one particular thing. Oh I’m going to look at birds, or I’m going to look at leaves. I thought that was an interesting way of applying that to things happening inside my body. Just brings a different quality of baggage to it. I was thinking about focusing on sensations in the chest and thorax and pelvis, and observing those changes in muscle tone as a kind of dynamic. Like if you were graphing it, how would those intensities ride up and down? And then it’s that spatial and volume thing as well, so how those things move in and out, and then relating that back to the observations I was making in the landscape about changes in the acoustic volume, like a sense of acoustics with the air around you. The echoes and reflections you are receiving. And then back again on these meandering rhythms, about how the tension can go down and up, and different parts can go back and forth in your attention, depending on what’s happening inside your body. And then it’s basically this kind of oscillation between a particular detail or something inside you, and then a particular detail of something outside you. Then, directing attention back outwards to the environment, focusing in on the birds around us, the flies crawling on our skin, distant engines, cows…just feeling that entire auditory field, a kind of sonic field. And then within that larger field, focusing in on the acoustic properties again is there a sound to the air or quality to the air that would be different in, say, a car park or a church or something like that, and just feeling that quality. Shifting attention now to spatiality, and if you had like a clock with 12 o’clock straight ahead of you, taking a bit of a measurement of everything around you in terms of, oh you can hear a bird over there, crickets over there, some trees or an engine in the background. What can you hear directly in front of you? And if you can’t hear anything at all, can you be sure that you’re not hearing anything at all? And then how long does it stay silent for? But just that exercise of can you actually focus your auditory attention on something in front of you, even if there’s nothing there? Can you focus on that silence, and using the sounds around that field as a kind of reference point? So I can hear something there, I can hear something there, but what can I hear directly in front? So that was one little kind of focus, and then…this goes on a little bit, sorry. Lizzie Muller: It’s so exciting, I’m amazed! 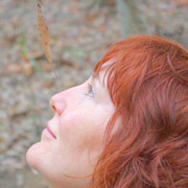 Somaya Langley: Like a breathing in and outdoors workshop? George Poonkhin Khut: Yeah and it doesn’t even have to be breathing, but it’s just… And out of that for me was a reframing of my sense of myself, How this type of attention canshift my sense of who I am or how I am, and that experience when I see it in relation to just all the other things changing around me. Lizzie Muller: That’s a pretty concrete outcome, George. 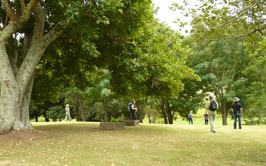 Lian Loke: When we were here the other day I decided to go on the amphitheatre walk, and it was quite a find for getting accepted into things out there. And as I wrote on my blog, there were two main places that caught my attention. The first one was just quite early on the walk where there was this very thin, spindly tree that I described had a surging verticality that I felt in my own body, and that kind of stuff. And then I moved around up the trail a little bit and there was another tree; this tree had like really orangey, peeling, scaly bark coming off it, a bit of a sort of mushrooms or something. I stayed there for a long time and then I listened to the sounds that were around me as well, and I used my camera to try and record some of the sounds. And then that took my attention to how I was actually responding to the sounds as well, where I was feeling it in my body. Because there was some quite sharp…things were dropping from the trees; sort of crackly, sharp sounds. It was sort of this physical spasming around my diaphragm or something. And I thought I could just listen to the sounds and so see how I react, and I had my camera out faced up; just turning my body a little bit towards the various sounds. And then again I had the same sensation on that first day that I had today, where I felt that I was a bit of an intrusion in the bush, this kind of very solid, clomping thing. Maybe it was my boots or something, but today I was heading up the same path and I went to the same spot but they weren’t resonating in the same way. But while I was there… It’s quite a steep slope up there and I started thinking about the sounds I was making in general, and I thought maybe I should take some stuff from yesterday – like George’s slow movement stuff – and actually see how slowly and quietly I can move up the track. And I just did that for a while and still trying to attend to what was going on. Shifting my attention between a greater field of vision, and then what was on the track, and seeing whether that was a crackly leaf or a bit of gravel or sandy bit or whatever, and trying to place that. So you really just notice how you are transferring your weight and how you have to control your body in these slow movements. So I thought, that’ll be great, I can take people back there and do that, and that’ll be a great experience. And then I got chased away by the flies! This horse fly kept coming around and circling me and I’m, like, ‘I’m out of here’. And I scrambled down the path back towards the gate and it was still hovering around me. Then I thought I’m just going to exit, I’ve had enough of this bush thing, and I’m just going to head back to this grassy patch up here. But then I stopped down near the gate, and there was this long wooden stick-pole thing that I’d come across the other day as well. So maybe I should do something with that? And then… I was thinking I need to learn how to defend myself in these situations! Because I was up that path by myself as well, and started getting a bit creeped-out…something might come upon me and…I need a weapon! So I got the stick and there was this leaf, a few leaves around it, and I thought…I’m going to pretend that’s a fly, and practice my spear study! There’s a couple of things I did… There’s just this sort of whole…it’s not very good, I kept missing! It brought back a primitive man-hunter thing, and trying to use my whole body in the action. Lizzie Muller: It’s quite Mad Max! Lian Loke: Mad Max! But I’d had enough of that, too. So I thought I’m nicking off to the beach. George Poonkhin Khut: That was yesterday, or today? Lian Loke: That was today. Yeah, I had a bit of trouble today focusing. Lizzie Muller: I like what you’ve done. Lizzie Muller: Did you know you were going to do that before you came? Maggie Slattery: Yeah we negotiated that yesterday. Jonathan Duckworth: It was a way of getting me to come. Maggie Slattery: He worked with my resistance. Catherine Truman: Has anybody ever heard of that happening? Jonathan Duckworth: I think what happened is they hadn’t actually seen me because I was at the top there just on the other side, and they came right over, saw me, became startled, and then started going in all sorts of directions. So I think I realised at that point that perhaps I was in their territory, I was in the insects’ territory; it was a place that I shouldn’t have been, so that gave me a strange sense of my body being displaced in a place it shouldn’t have been. So today was an opportunity to see if I could actually conquer that; see if my body could actually conquer a bit of territory, or a bit of space. So we decided to do the cedar walk, and we kind of got halfway and then we retreated, in a sense, because it was that Lantana experience. Maggie Slattery: It changed, didn’t it? Jonathan Duckworth: It changed very suddenly. Jonathan Duckworth: Acoustically, it was oppressive. How would you describe it at just that point where we reached that tunnel, almost…? Maggie Slattery: It became a little suffocated. There was a lot of intense greenery suddenly, whereas before the sky was always dominant. The smell changed, the sound changed, and the feeling of alien bush became very strong. Maggie Slattery: By the horse flies; they intensified. Jonathan Duckworth: Those horse flies! They just stuck with us, almost like chasing us out, like ‘you shouldn’t be in here, this is our bush’. So as we were walking back, I sort of felt still being pushed out. But there was a moment where I thought I’ve got to try and break this cycle before I get pushed back into the paddock. And there was a moment which was, can I play to counteract the being pushed out? And there was a small spider’s nest; it was a leaf, a curled up leaf dangling from the tree. And for some reason I thought, well if I play… There was a sudden urge to play with my body with this spider’s nest, which was to balance the leaf on the tip of my nose. And we all had a go at it, and we suddenly forgot that the flies were annoying us, the environment wasn’t so oppressive, and our bodies started to take up the space that was there. Before it had been sort of crushed and compressed. Maggie Slattery: We were focused, so everything lined up for that one focus. Catherine Truman: Did you take a photo? Jonathan Duckworth: Yeah, the spider actually came out, and we still did it; we balanced it and the spider’s moving around trying to balance itself. Lizzie Muller: That’s a good story. Jonathan Duckworth: Oh I did, didn’t I? Well, that’s ‘let’s play some more’. Catherine Truman: That’s not an invitation, that’s a direction! Jonathan Duckworth: But I think we had, at that point, actually claimed back some space, just from that play. And we weren’t rushing to get out; we weren’t in a hurry to leave. Jonathan Duckworth: I’ll show you some of the photos. George Poonkhin Khut: Oh that’s great; they’re beautiful photos, all these people with leaves on their noses. Maggie Slattery: So this was with us, the whole time through this story. Catherine Truman: If you take the leaf off her nose, it’s like “to be, or not to be”. Lizzie Muller: Exactly, it’s a great portrait, that’s true. If only you guys were on Facebook! Jonathan Duckworth: But yeah, it was quite a pleasant experience. Somaya Langley: What came next; what did Maggie do next? Maggie Slattery: As the leaf was turning, we were turning. Jonathan Duckworth: Do you want to talk about the next step? Maggie Slattery: Yeah, I guess if I go back to the first day. I was interested instead of finding a place in nature, so to speak, that I was looking for a place of attention. So I had this thought that it was, for me, situated attention rather than situated body. So I decided just to walk and did the amphitheatre walk, and to pay attention to myself in the situation that I was in. And I found that I related as coordinates to the sounds that were going on. That was absolutely where my attention was going; the sound of my feet on the path, and then various sounds that moved my attention around the place. And I noticed that, in that movement of attention, when it got lost was when I was thinking of ideas. And it wasn’t until I realised I was thinking and my attention had gone away from situated, that I would then return to body, I guess. So, today, being able to be with Jonathan brought another quality to be in this experiment, and I needed that; it was connecting. And I wasn’t intentionally working that attention, but more that connection with you. And Liz was there for the first part of it, so with both of you. And it wasn’t until you brought the focus to the leaf that it then came back to attention again. And I loved that, and was ready to come back here and get away from the flies. And then you invited me to think of an idea; and I just go into jelly, I go into a quiver at that point! Anyway, I went and it was really beautiful. And then just going through the feeling of, well there are ideas once I just let go of being afraid of their being an idea or not. And then attention, it wasn’t so much that it was focused; it was actually about a free attention. And I was really influenced by what you said yesterday when we were doing the brain drawings, and your description of world. And it made world much more personal to me, and that’s had quite an emotional effect. At the moment just where is world and how the world – my world – is out there and in here. And also, you mentioned well I’ve now been in this place so this place lives in me. So that was a quality of engagement that I found in my interaction. It was…we all started just being part of it, really. Maggie Slattery: We all just started being part of it really. George Poonkhin Khut: That’s like a rib cage. Catherine Truman: Beautiful, very Andy Goldsworthy. The shape of the rock underneath was really important was it? 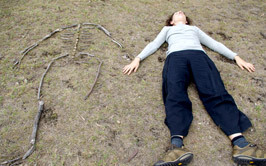 Maggie Slattery: Yeah, first of all in the rock I saw a body, of course, and so it’s exo-skeletal, but it’s not… And then next thing I knew this shape was emerging from a neighbouring rock. It was sprouting, and I thought it was like the spurting, acetyl-chlorine. And then I thought it looked a bit like…was a neuron drawing from yesterday, but it just transformed into a thorax, even. Jonathan Duckworth: So, I’m not sure what I concluded from that. I think it was a sense, through interaction, a sense of play as perhaps one way of claiming a sense of space and self that can be quite powerful. I think that’s something that interactive artworks do, and they do well. But it was just that completely different way of experiencing what play could be, especially when it’s spontaneous. Lizzie Muller: There’s some kind of developmental psychology around play. This PhD about place and interactive art which was about the importance of play for children because of their lack of power in the world, and the need to play to establish territories of power. George Poonkhin Khut: Which is a classic thing, that sense of being powerless, standing in that bush and how that was turned around through play. Lizzie Muller: Alright, so we should have fun! Somaya Langley: I just have to…I can’t do this alone, don’t want to do this alone. Lian Loke: Like, out there on my own, what’s the point, you know? What a disaster. Kind of wanting maybe an audience; actually I wasn’t realising it like that…it was a witness. Lizzie Muller: That’s interesting; the ‘other’. Lizzie Muller: So last time we came down I was a bit the same as you, a bit like the pressure to have an idea, to come up with something, to do something, to be on one’s own and that sort of stuff. Having said that, though, I’m really grateful for this workshop and to you, because it was making me think about what you said about the invitation. And your invitation was very open, so open that I think a lot of people were scared. And my biggest fear always is a waste of time. I can cope with anything but a waste of time, so this terrible worry that I might be about to waste my time. But you had given me an invitation to come go out there and risk that. So that first day I was quite interested in scale, because of the work we had done that morning. And I was thinking about the scale of my own body and drawing it, and how different it can be when… And I was very interested in skeletons and measurements and… It’s funny to think back now because I’m totally not interested in that at all, two days later! But at the time I was really thinking about proportions and measurements. And I think probably I wanted to read the instructions to get it right. I read the instructions and it said ‘scale’, and I became really… yes, I can grasp that as a concept, that’s in my head at the moment. So when I was thinking about where to go I just paid attention to the fact that I was drawn very much to that little house, which I had been to many times before, and I’ve never really liked, and yet I was still drawn to go there. So I asked myself why and realised that, for me, when you are put in an environment that’s this large, I need to find something to focus on, to walk towards; to have a destination to go to and also something that carves out of this landscape something that is at human scale. Because the trees…nothing seemed to me of human scale. I was at sea really, scale-wise, and then that little house spoke to me. It reflected back to me my own shape and size through its doorways and its windows and its seats. It said to me, this is humanity’s shape and size in the world. So I was very drawn to that house and reflected on that idea of shelter in the bush and what shelter might look like, and does a shelter need to reflect its occupant? Thinking about the wombat holes, thinking about whether there was a way I could make a shelter for myself in the bush that need not be so human, you know? Like, how light could your shelter be and all of those things. And anyway, I sat for a long time thinking about that. And the idea of being exposed and housed, which I suppose was just a reflection of my feeling vulnerable and exposed emotionally as well as spatially. So I built that skeleton out of sticks because from the very moment we had been drawing in your workshop, I thought of my skeleton, my skull, and how hard my skull was. And I wanted to find something that was like an analogue for that in the environment that I could match…about matching myself to something and finding an identification or a mirror in the environment. And then I went looking for stones, but then I saw sticks and I thought of those as being very much like my skeleton, and thinking I could measure it which, as you were saying, had become this kind of obsession with me at that point; measuring so that I would get things right. I drew them and created them. So for me it was very much about measurements and recreating an image of myself that I could rely on to be the right size. And also to see myself from the outside, because I was up there and I saw George and I could see Lian, and I wanted to see myself; it was a weird experience, but I really wanted to see myself from a distance and to see what size I was in the environment and how I looked to the environment, and weird things like that. So I made a stick man, but then it was a slightly unsatisfying experience, really. The idea of making the stick man was much more exciting than the making. And making it I became quite bored with finding these things that matched him, and I lost interest in making it accurate and I nearly gave it up. And I thought, oh having the idea was enough. And then maybe I’ll gather them up and take them somewhere else and lay them out again, and put this man in various different places. And it was kind of an interesting experiment. But then the next day we had your second workshop, and a real transformation for me in terms of experience from the making of the stick, and I did that specifically, you know? I’ve got clay and I’m going to do exactly the same thing as yesterday and I’m going to see what happens with that. So I made another stick person, and did it with the same measuring. So I made a piece of clay the same length as my arm and I folded it in four and used it as a measure for that bit of my arm. Labour intensive for not much reward! And similarly, didn’t enjoy myself very much at all, but was determined to do it. So then yesterday Catherine taught us a bit of Feldenkrais in the water, and yesterday was very playful and we were all down there together pretending to be jellyfish, and it was relaxed. And we were learning to do strokes and I’m whacking myself in the nose accidentally, and it was fun to play in the water. But today I came back with that and wanted to go to the water and see how I could work from the inside into that environment. And so I started off just meditating, which I know how to do anyway, to become present in my body. And it’s something that I’ve been wanting to do for the last four days and haven’t had any other time, so for me it was a great opportunity to find the time to do it. And my real intention was to get to this point of interacting with the water in a mindful, physical, embodied way. So I started with a sitting meditation for 20 minutes, and came into that place, and then I did a walking mediation up and down the edge of the water. And similar to you, that relationship between your weight, pouring from one side of your body into the other side of your body as you walk very, very slowly; and that feeling of stability, all feelings I’m familiar with from walking mediation. But then turned to the water and, ok, I’m going in! And did it as mediation, and just walked as slowly as I could into the water, and very, very slowly felt the weight leave my body. And it was an extraordinary feeling, feeling the stability start to very slowly go from your body. And it gets to your stomach and I’m starting to feel my breath… And because that water is so amazingly clear and warm, you can just keep going. So I’m just walking straight forward doing a meditation and the water’s coming up to here. And yesterday Catherine also taught me to breathe with my mouth open and let the water go in. I mean, who would have known that yesterday’s lesson was such a fortuitous preparation for today? Because through applying all those things that I wouldn’t have been brave enough to do today, I was ready for. And just letting the water run into my mouth and keep walking, and the water gets to just over my mouth, and I know the next step is gonna go over. So I take a breath and then just kept on walking with my eyes open; and it just got to the top of my head and I let myself do what you taught me to do yesterday; I let my lungs lift me, and my feet leave the ground. And I’m just hanging in the water. So I made this transition, I could just cry telling you about… I made this transition from being a solid, upright person with gravity and a skeleton, all this skeleton I had been trying to work out, feeling it move, and then just to be released and floating, with eyes open; you can just hang there. And then that transition to coming back up. And the thing I enjoyed working on was not being scared of my breath, in knowing that when I came up I’m going to be able to breathe. Because the first five times I did it I found that I’d come up and (gasping). As soon as I came up I’d be gasping and flapping. And it’s like you don’t have to do that because you really know that you can swim so you’re going to be able to breathe. And then I made this changed in the way I was doing it, and just tried to breathe as calmly as I could and let my arms fall; breathe and go back down again. And at that point when I made that discovery that I could breathe without panicking, the whole thing became a kind of breathing meditation. So I’m just coming up and breathing in, going down and breathing out, coming up and breathing in… And it was just an extraordinary feeling. And then I tried doing a walking meditation with the water up to here, which means every time I breathed, my foot would rise. So I tried a walking meditation from my lungs, which was also an amazing experience. Walking meditation for me usually originates in my pelvis and in my feet, whereas in this one I would breathe in, my foot naturally goes up; I breathe out, it goes down… So I needed that. Then I walked out, and the walking out was more extraordinary than the walking in, because I’d been in there so long that I’d become very used to the weightlessness. And as I walked out, first of all my head became heavy; I could feel it in my neck, and then this part of me became heavy. And I was saying to Catherine earlier, as soon as I felt this part of me leave the water, I felt more weight in my feet, and it wasn’t an unpleasant feeling, it was like… And there’s a bit of stability coming to me which I was actually missing in the water, and hadn’t realised I was missing. And then slowly my body’s coming out and more and more weight is coming into my feet as my body comes out of the water. And so I got to this dramatic area around here and my lungs came out and the buoyancy disappeared, and I was back on dry land, and very aware it was me walking on dry land; feeling my knees, my hips changed, my knees changed. I was feeling the gravity come into my body from the head down, or from the feet up until I got to the lapping edge of the water and I was like…I’m a solid, strong being with gravity working through me as friend, anchoring my feet down into the ground and just incredible stability. It was an amazing feeling. Then I just went back and dried off! Jonathan Duckworth: Did the water give you a connected…sense? George Poonkhin Khut: And the salinity too, it’s not hard on your eyes. Lizzie Muller: It’s not hard on your eyes; you can open them wide, have it in your mouth, swallow it and not mind. It’d be good to go back light-hearted, because by the end of that I was in this kind of reverie. And it was quite nice when you turned up because you were kind of more giggly and pleased to see the water, and I was just kind of… It was quite a relief to let go of that intense… And the goats came along and started bleating, and everything lightened up and that was good. Catherine Truman: The most valuable thing for me’s been the feedback, because the feedback’s just really been fantastic. Yesterday I was exhausted I think, and I released that I had still been, by choice, concentrating on giving out, giving out, giving out… And that’s been fine, that’s been fantastic, but it was hard to go into an environment like this and stop. And back in Adelaide I’ve bee connecting with trees, just in that kind of domestic yard, and then parklands and then the wider area. And realizing they’re kind of witnesses to things; things pass them by and history happens and they still stand strong, but they’re under threat. So coming into this environment I naturally started to look at the trees, and realised that there’s a lot that goes on underneath the ground that I’m standing on. So there’s more to the tree than I see on the ground, and what can I do with this? Trying to make something happen, trying to make something, actually. Lizzie Muller: ‘Love me’! A needy photographer! Catherine Truman: The emotion was there, I captured that, but not the feeling. The love wasn’t there. And also I was trying to get the joining on the ground between the base of me and the base of the tree, through that shot. It was an idea and I couldn’t express it, I couldn’t make it happen, but that was ok. And it was nice that I felt it was ok.
You know, in my work I have to make things happen, and so today I decided not to come with any ideas at all, and I just wanted to be wet again! 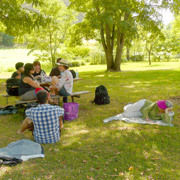 But it was different than that when I got there, and I remembered a sense of when you… We were talking about the idea of this; I was resisting it, resisting that idea of taking Feldenkrais into a wider environment. But of course, Feldenkrais is here (gesture), so it doesn’t matter where you are. So I was thinking about that as I just decided to be in the water for as long as I could. First of all I was just interested in what the surface was, how I was perceiving it, what was meeting here (gesture), and what was meeting it from here (gesture). That’s all I watched for a long time. I started to be aware of the fish underneath, and the water, and all sorts of things; the currents, the lights, whatever debris was falling in, the fish breaking through both spaces – really simple stuff. And it got simpler and simpler until it was back in my body, and I was anchoring myself in that strange feeling of not being in gravity, and yet you are in gravity. I was noticing the weight of my head above the water compared to the weight of me underneath, and how if I just shifted that slightly what was happening underneath would shift. And what I needed to anchor. It was very simple; in sitting, and not sitting on the surface, but just anchoring my feet, it was almost like there was a little chair underneath me. Where I put my arms, what that was doing to my body. I was doing Feldenkrais under water and that was a nice thing. And how my breathing would change my position. So it’s very internal and yet external at the same time. That was it; it was really nice. Lizzie Muller: You were in the water a long, long time. Catherine Truman: But I can be in the water a very long time, but normally it’s struggling with the sea. But this was so still, I didn’t have to struggle with anything except in myself, and that’s really rare in water, to be in water like that. Because it’s normally a threatening… You can’t breathe it in and survive, so you have to find another way. Jonathan Duckworth: I think we’ve all got something out of it, strangely, which is great. So thank you. George Poonkhin Khut: Let’s head back for some lunch and siesta!